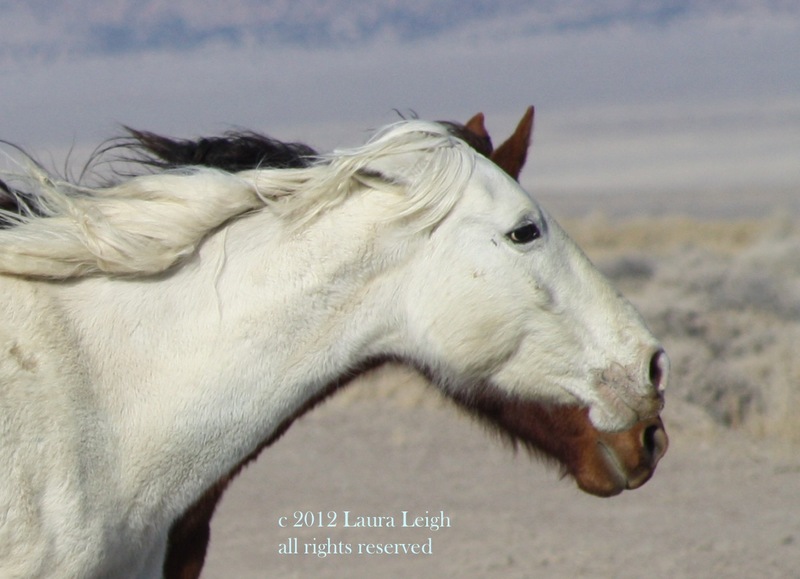 The Bureau of Land Management (BLM) will be removing wild horses from the Reveille HMA 50 miles east of Tonopah. The date for the operation is scheduled to begin sometime AFTER September 15. The operation will take place after the Triple B removal and we will keep you posted as things develop (we have not received confirmation on the start date of Triple B but expect it to be around Sept. 12). EDITED TO ADD: The date for the trap site adoption ha been set as November 8th. The removal operation will begin likely beginning of November but subject to change (we will keep you updated. If you are interested in adopting click the flyer to enlarge. 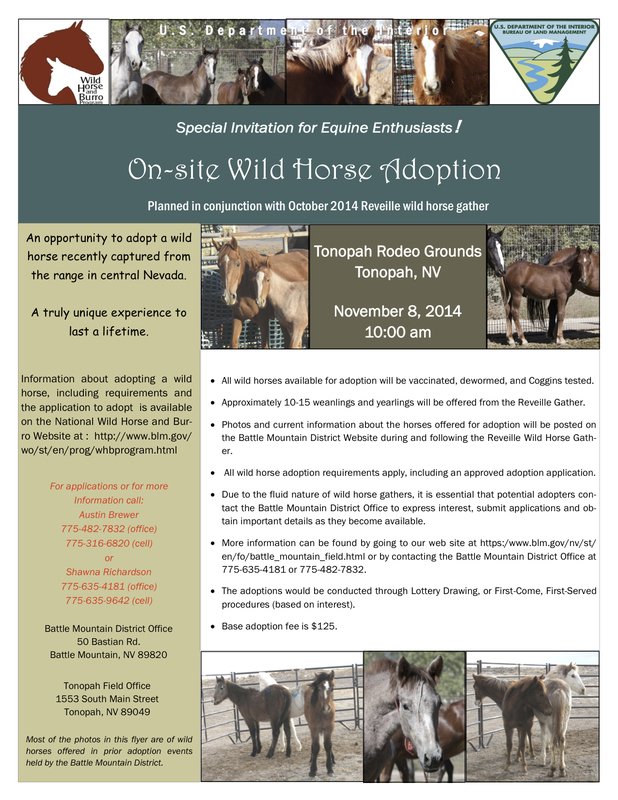 Trap site adoptions are a way to adopt a young wild horse without the horse ever going to a BLM short term holding facility. It gives you more control over stimulus your horse is exposed to prior to adoption. ALL BLM adoption requirements apply. Youngsters will be branded and have coggins completed before adoption date. note: objective is to remove “off HA” wild horses and trap, treat and release the horses within the HMA. Those decisions have not undergone challenges post National Academy of Sciences (NAS) report of 2013. The NAS report notes specifically inventory of this area as lacking data in the past. This would bring any prior court orders that relied on data concerning any factual “AML” into question. However we are awaiting the BLM review on NAS and any policy review to determine appropriate discussions on Reveille. This area also contains some unique genetic traits specific to the HMA that identify it as relatively isolated. 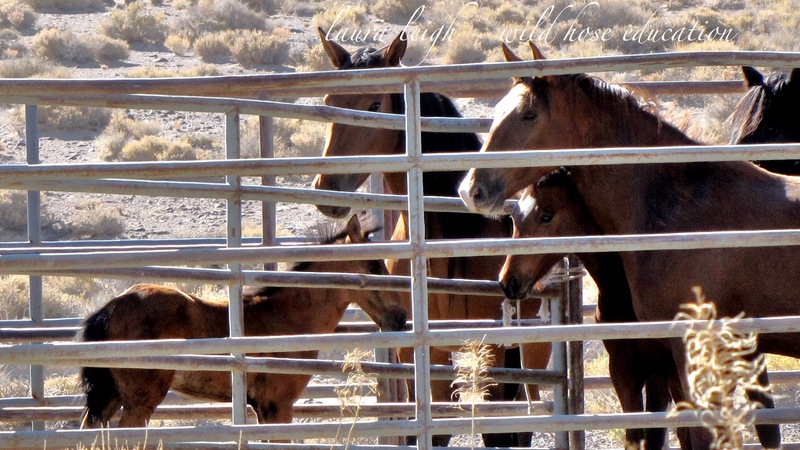 The last operation in the area was in September of 2010. http://wildhorseeducation.org/roundups/roundups-2010/tonopah-nv-2010/ Events that occurred at that operation were part of the need to file the First Amendment claim. In 2010 the press credentials of Laura Leigh (writing for Horseback Magazine) were refused, yet the Las Vegas Sun was literally at the trap. During days of operation the public was limited to just a couple of days of observation while three HMAs were subject to removal (Paymaster, Montezuma and Reveille). And in this district specifically? 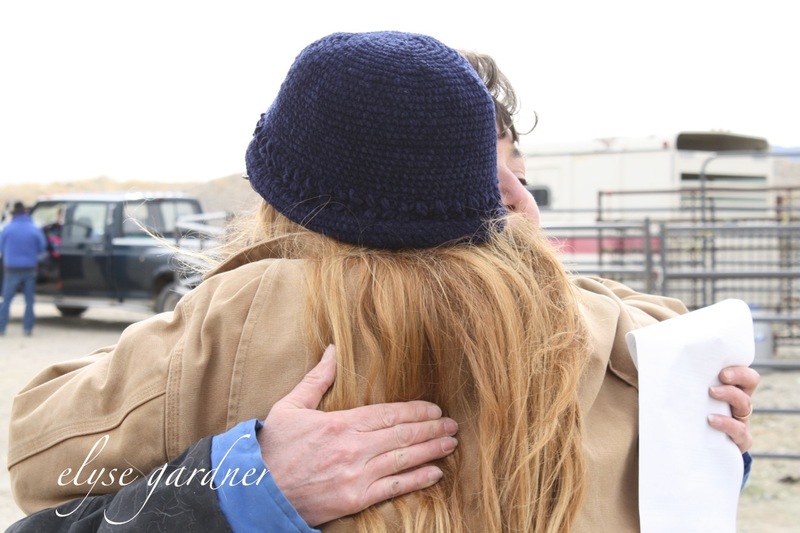 We have been working very closely to improve all communication toward gaining appropriate public participation and improved tools for managing wild horses and burros. This district has more HMA’s than all other states and every other district. Over time a relationship has been built that has a respect for the law and each other. We began on “rocky footing” but have worked hard toward solving problems. We look forward to continuing that work whose spirit truly came to life at the Stone Cabin roundup of 2012. 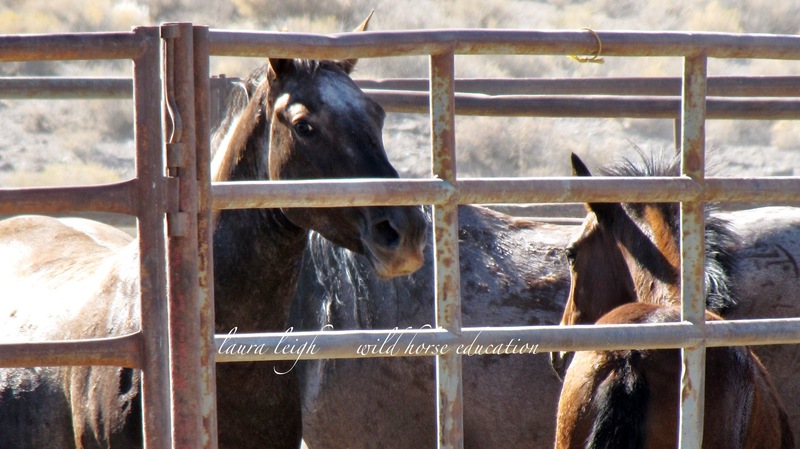 Not only did we adopt out some amazing youngsters (4 of which I still know) but at the end of the roundup there was a significant release of wild horses back to the range (video below). We are hoping to bring you more news soon. 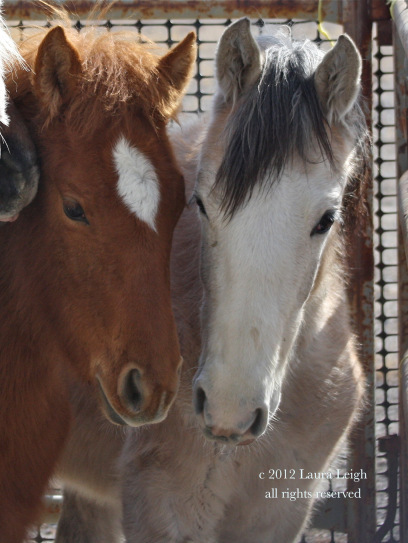 (Also for more info on this area, ground zero for the NACO suit, please read this link as it contains vital information http://wildhorseeducation.org/2014/08/15/focus-nevada-battle/ Wild horses and burros do not exist in a vacuum). In conjunction with the removal of wild horses, birth control and release, there will be an opportunity to adopt a horse directly after capture. This option allows you to bring a young wild horse home without that horse ever taking a step onto a semi truck heading to holding. It allows an adopter to control the stimulus that the horse is exposed to. It keeps the young horse away from any of the issues of our current crowded holding facilities. This option also allows adopters to actually see the area the horses came from. To get a real glimpse at the life the wild horse had before going to your home. At WHE we feel this is an important part of understanding the beginning of a relationship that can be a life long journey like no other you can experience. If you have ever thought about adopting, this might just be an option for you.